A few days ago, our family went to a drive-in theater and watched a double-feature under the stars. It was a fun time with friends and a first for our kids. The movies were Planes and Monsters University. I’m no movie reviewer (as you shall see), but the contrast between the two movies was fascinating. Planes was generally underwhelming, formulaic, predictable, and kind of boring. Monsters University, which really was good, looked like Casablanca in contrast. It was a good time and led to some good conversations about what makes for a good story. That got me thinking about some of our family’s favorite movies. These are a few, though not necessarily a “Top 5.” I limited myself to just three, two-word sentences to describe each one. Very difficult. <—-See? I somehow included only one Pixar movie. Those are all (excepting that aberration of aberrations, Cars 2) favorites. I’m very interested to hear some of your family’s favorites. Breathtaking cinematography. Excellent story. Virtue attractive. High adventure. Happy heroics. Nobility abounding. Absorbing tale. Wonderful characters. Flawless storytelling. Fun sequences. Light, heavy. Excellent soundtrack. Whimsical art. Happily different. Engaging history. We love Star Wars. I don’t remember anything untoward in Monsters U, but it was at a drive-in and it wasn’t always easy to follow. I know I loved the storytelling far more than Planes, but that was easy. 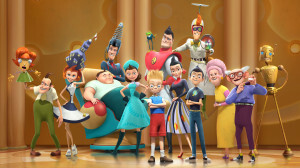 I probably have a high tolerance for silly-stuff humor, but what I dislike is non-stop gags and physical humor/violence in animation without a good story. Ag, it’s the “glorifying” of all the college traditions that, when examined closely, are not appropriate for anyone, never mind kids. Come to think of it, there are a few other favourites here, Sound of Music, Mary Poppins, Annie, Herbie movies, Little House episodes and Tin Tin too. Funnily enough, my kids are loving the Cosby show episodes they’ve borrowed from a friend. Talk about clean humour with a great moral compass! It’s brought back good memories for us. Cheers! 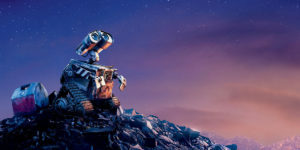 I seem to be one of the oddballs who really liked Cars 2. I think it’s due to my penchant for James Bond movies growing up. And my four-year-old son loves Cars (both films) so much these days that I’ve been completely won over. My girls aren’t as fond of Cars, but they’ve loved the Herbie movies, which were favorites of mine growing up. We’ve also made sure to expose them to classics like The Princess Bride and the original Star Wars, though we’ve avoided Empire Strikes Back so far. The kids also love Mary Poppins, and most recently we were able to hook them on The Sound of Music. Ummm…I know there are more, but that’s more than your three phrases per movie already! Thanks, Loren! We love the Star War Trilogy to, and The Princess Bride, though the kids haven’t seen it yet. We love Cars. Amazing movie! The Sound of Music. Wow. What a movie. Ok, wow. I’ve only seen one of these, and heard of two others. To the internets! I made the other ones up. 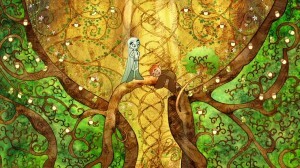 Thanks to this post, I finally watched The Secret of Kells last night, and I loved it. 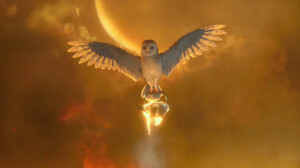 Legend of the Guardians is one of my favorites, too. I’d add The Adventures of Tintin to this list for its sheer, well, adventure. It’s like Indiana Jones for kids. My oldest son is too young for it, but watching it made me feel like I was 12 again. Thanks, Josh. Nice recommendation. We haven’t seen Tintin yet. LOVE family movie recommendations! We are big musical fans, and the kids have just started the Star Wars obsession! Our favorite musicals were Sound of Music and CATS, although my kids were raised reading T.S. Elliot’s “Practical Cats” poems and listening to the music first. I should warn of Rum Tug Tugger’s rather provocative personality (that went over my kids heads) and a strange scary scene that we have to fast forward through- but they love the main songs and we just went to the soundtracks they know and love. Favorite “girl” movies…the Shirley Temple “Little Princess” movie, “Heidi” and “Rebecca of Sunnybrook Farm”- so great. 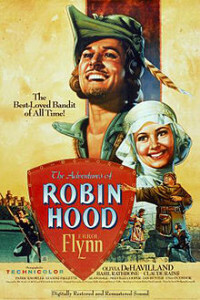 Favorite “boy” movie (that my girls love too)…the Robin Hood cartoon version with the foxes. I can’t wait to find the people version! Love this blog! Never comment but read in entirety with each post! Thanks for this site! Keep the movie and book recommendations coming! My favorite post to date was the boy book recommendations…refer to it monthly!!! Thanks so much for the encouragement! And thanks for speaking up. Loved reading your comments.